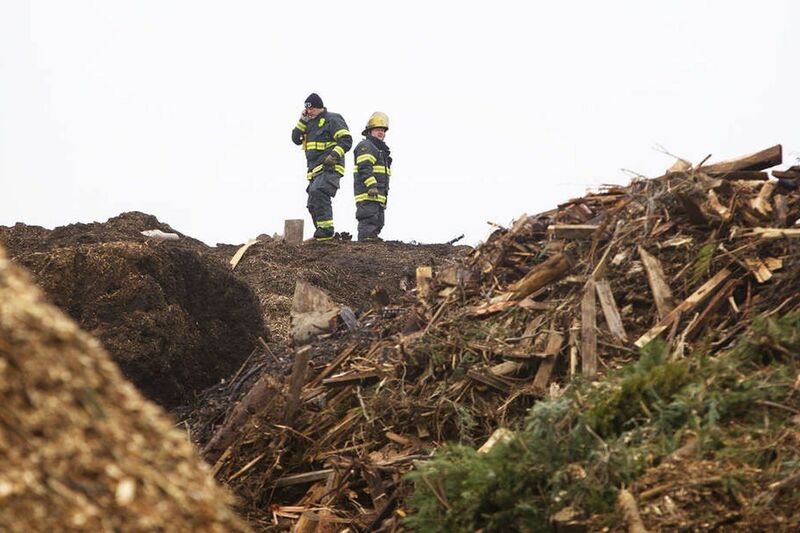 Two city firefighters stand atop a mountain of mulch watching for any lingering hot spots. The fire in the Somerton section raged at its worst Sunday. NORTHEAST PHILA. The scent of burning wood wafted over a Northeast Philadelphia neighborhood Tuesday as firefighters continued to monitor mulch piles that had burned out of control for more than a day. The blaze began about 2 a.m. Sunday at the waste-wood site operated by Northeast Philly Mulch on Tomlinson Road near Roosevelt Boulevard in the Somerton section. Fire Department Capt. Clifford Gilliam said crews used heavy equipment to break apart the towering stockpiles of mulch before they could attack the blaze. Firefighters had extinguished the blaze by 8:30 p.m. Monday, according to Gilliam, but engine crews were back Tuesday watering down the mulch piles. No cause had been determined. Igor Gutsol, who lives in the neighboring Camelot Estates, said the smoke was so bad Sunday that he had to take his children, 7 and 9, to sleep at their grandparents' house while he and his wife went home for the night. "We didn't sleep well at all," said Gutsol, 32. "We woke up the next morning with headaches." Another resident, who declined to give his name, said he took his 3-month-old daughter to a hospital for Tuesday out of concern for her breathing. The neighbors said they had been complaining for more than a year to city officials about the smell and debris from the mulch operation blowing onto their properties. Gutsol said that residents met with Northeast Philly Mulch's manager and owner last spring and that the company, promising to make conditions better, built a dirt wall and moved its mulch piles farther from their properties. A woman who answered the phone at Northeast Philly Mulch on Tuesday said its owner was unavailable. State Department of Environmental Protection records show the company used to take in waste wood and waste chunk concrete, and grind those materials into mulch for landscaping, but had recently stopped. The pile of waste chunk concrete at the site is about 35 to 40 feet high and possibly unstable, according to DEP citation reports. Regulators cited Northeast Philly Mulch with violations during site visits June 5 and July 1, alleging the company was not utilizing best management practices because it failed to submit paperwork to the DEP for a formal permit exemption, according to DEP spokeswoman Lynda Rebarchak. City records show the company operates on property owned by Roosevelt Boulevard Associates L.P. No one from that firm could be reached for comment Tuesday.